Apologies, as this post is late in coming! 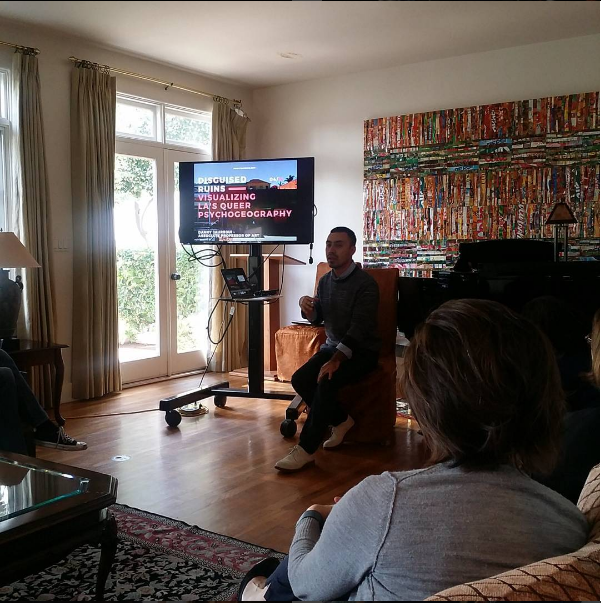 The semester is nearing its end, and I’m finally getting around to writing the recap of the High-Tech Happy Hour that DigLibArts and the Garrett House hosted several weeks ago. This time around, we invited faculty recipients of our digital pilot projects to share their research projects. This served as a showcase of faculty digital research, and inspiration of other faculty and staff on campus. For the past year or so, Professor of Philosophy, Paul Kjellberg has been developing a digital project to allow students to transcribe and annotate philosophical texts. Eli Thorkelson, Postdoctoral Fellow in Anthropology and DigLibArts, has been working with Paul for the past several months in developing a version that can live outside of Moodle, and that may eventually grow to be an open platform that can be used by faculty and students anywhere. Modeled somewhat on the popular Genius social annotation platform, Tranversions is designed for faculty to upload original texts while providing a secondary window where students can annotate, translate, and respond to each others comments. 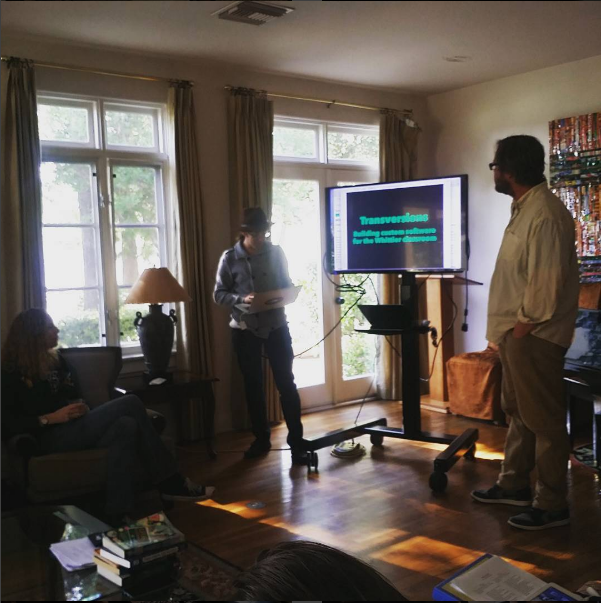 Eli Thorkelson and Paul Kjellberg present their Digital Transversion project. Professor of Education, Kathy Ralph recently won a pilot project grant to work with elementary school students to develop video book reviews. The project gave students the tools to create original critical book reviews in the form of Youtube vides, and to print corresponding QR codes placed on the books in the classroom and school library, these QR codes could then be scanned by one of the school’s iPads, which directed student readers to the Youtube videos. The project gives students training and access to useful digital tools, but also the confidence to produce their own media, to revise, edit, and publish their videos, giving them complete ownership of their work. 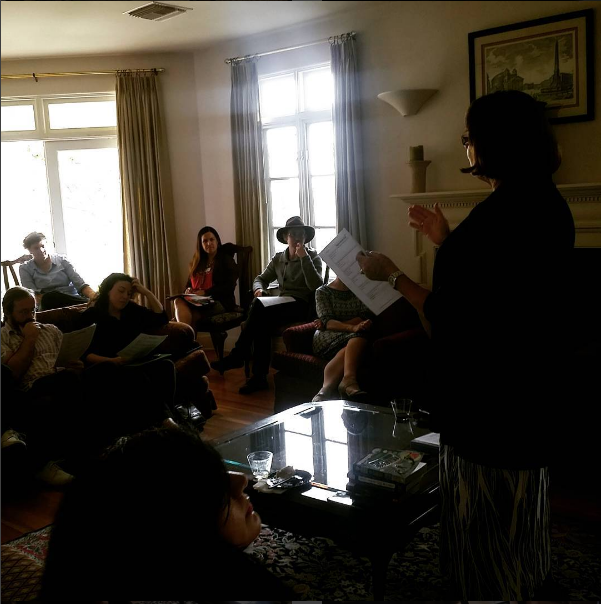 During her talk, Professor Ralph also discussed safety measures taken to ensure the anonymity of students, material considerations, the readings reviewed, and prompts given to the students. 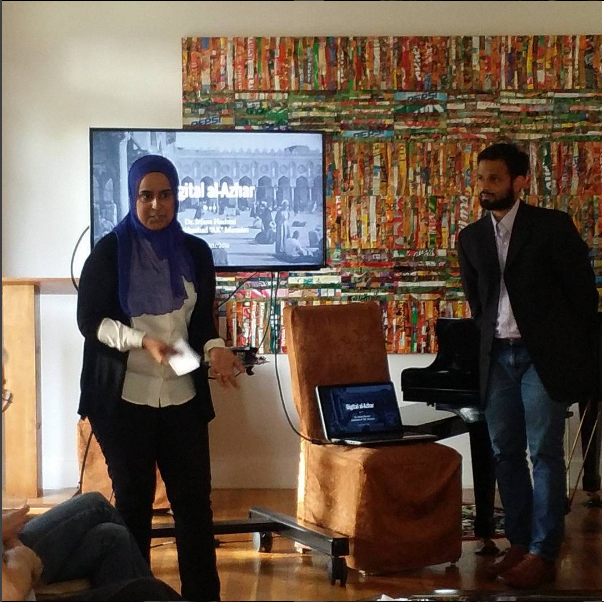 Assistant Professor Irfana Hashmi and AK Munaim (Graduate Student, Urban and Regional Planning, UCLA) then shared their collaborative 3D visualization project based on Professor Hashmi’s work a Medieval Egyptian Mosque, al-Azhar, and its shifting lockers. This project uses digital technologies to visualize in-depth historical and archival work done on religious, social, and cultural spaces. In addition to providing a tour of their prototype, Hashmi and Munaim also discussed the tools, platform, the workflow, and other considerations. Professor Hashmi and AK Munaim share their 3D visualization of al-Azhar. The map (below) animates the shifts in queer spaces in Los Angeles as documented in the books. Since finishing the mapping project, Professor Jauregui has transitioned to a secondary project that seeks to make visible the erasures and shifts in space over time. For the presentation, Jauregui shared the process, labor involved, and the resources needed to produce this project, and the trajectory on which it has changed. Following presentations, faculty and staff were able to mingle and ask questions over food, wine, and aguas frescas. We hope you can all join us again next time!